The FBI is investigating whether a Russian banker with ties to the Kremlin, mobsters and money laundering illegally funneled money to the National Rifle Association to help Donald Trump win the presidency. Two sources familiar with the investigation told McClatchy that FBI counterintelligence investigators are scrutinizing the activities of Aleksander Torshin, who has been described as a godfather of a major Russian criminal organization. 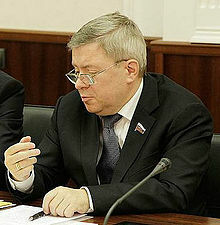 Torshin, a leading figure in President Vladimir Putin’s party, is a lifetime member of the NRA. Authorities said Torshin met with Trump’s son, Donald Trump Jr., at an NRA event in Kentucky in May 2016, when his father won an early endorsement from the gun-rights group. The investigation comes as special counsel Robert Mueller continues a far-reaching probe into alleged collusion between Trump’s campaign and Russia to undermine Hillary Clinton’s chances of winning the 2016 election. Posted: 1/19/18 at 10:19 AM under News Story.